Ashley Graham’s new body has some serious sparks flying. Despite being slammed multiple times for either “promoting obesity” or “losing what made her famous,” the voluptuous fashion model couldn’t care less. She is the proud founder of ALDA, an activist for body positivity, and was featured on the cover of Vogue, Harper’s Bazaar, and Elle. She is also the first plus-size model to be featured on the cover of Sports Illustrated’s Swimsuit Issue. Her recent pictures show her toned body, which is inspiring and empowering for millions of her followers. So, if you have insecurities about your body and your appearance, give this post a read. It will change the way you look at yourself. Swipe up! Not that Ashley Graham’s weight, height, or age matters. I am simply providing this information so that if you are someone who does not fall under the conventional “beautiful” category, you can see that you don’t have to be under any category, for that matter. Take a look. All I can say is, Ashley Graham is super confident in her own skin, and that’s why she looks so stunning in every picture! In a recent photo shoot, she posed without any makeup, and she looked more gorgeous than ever. But how did her success as a plus-size model begin? Well, for that we have to go back to 2000. She was discovered by I&I modeling agency while shopping at a mall in Nebraska. She was 12 years old at that time. A year later, she was signed up by Wilhelmina Models, and in 2003, she was signed up by Ford Models. In the years to come, she was on the cover of top fashion magazines. She was also a judge on the reality show America’s Next Top Model. Ashley also speaks at high schools about body positivity and is a strong supporter of the Health At Every Size movement. Here’s her inspiring TED Talk on body positivity. Now that you are aware of Ashley’s mindset toward her body and how she wants others to feel, let us take a look at her current diet and workout routine that helps her stay in amazing shape, physically and mentally. Ashley mostly consumes healthy food like lots of fresh fruits, veggies, lean protein, and healthy fats. But she also revealed to StyleCaster that she eats everything. Take a look at the table below to know what keeps her looking gorgeous throughout the day. Breakfast A smoothie made of kale, ginger, lemon, apple, beetroot, and parsley. Lunch Quinoa and brown rice bowl with veggies, topped with tahini. Dinner Baked salmon, arugula, and sweet potato. Snacks Chocolate Tree chia crackers. Cheat Day Lunch or Dinner Mac and cheese. Apart from eating healthy, Ashley also keeps herself active by working out. Here’s her workout routine. 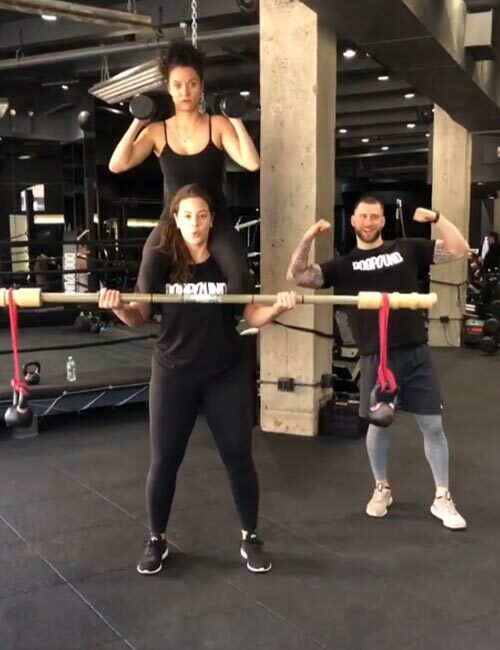 Ashley Graham’s Instagram and other social media accounts are full of pictures showing her working out. She trains with Dawin Pena and does HIIT like jumping squats, lunges, burpees, ball smash, scissor legs, and jackknife, and strength training like sledgehammer swings, planks, push-ups, barbell squats, resistance band hip thrusts, and double band sumo deadlifts. She also ran her first 5k marathon recently and goes for aerial stretching classes to keep her body flexible. But her favorite form of exercise is kickboxing. It helps her burn a lot of calories, improves her reaction time, and strengthens her bones and muscles. It is clear that Ashley is a fitness enthusiast and loves doing different types of workouts to keep her body fit, strong, and agile. Now, if you want to be healthy and fit, do the following. Body positivity and a healthy body image start in your mind. People around you may have shaped a “perfect” body image in your head, but it’s time to change that. Once you know and accept your body type and develop respect for different body types, you will not be bothered by how skinny or curvy your body is. Make your health and fitness a priority. Haters Gonna Hate, Shake It off! Fitness is a double-edged sword. If you avoid it, you are called names for the kind of body you have (“too skinny” or “fat” ). And if you make working out and fitness a part of your lifestyle, you are mocked about it. Don’t let it affect you. Shake it off and do what you need to do to achieve your fitness and health goals. Ashley Graham has made healthy eating a part of her lifestyle, and that’s how she gets all the energy and strength to workout so much and not feel tired. By eating clean, you can also change your life and protect yourself from various fatal diseases like cardiovascular diseases, kidney disease, and diabetes. Keep your body active by working out at least three days a week. Enjoy your workout, don’t make it a punishment. You can go for long walks, runs, swim, dance, lift weights, and do bodyweight exercises, TRX training, kickboxing, or yoga. Yay! The cheat meal day is a personal favorite. But you have to earn it by following a healthy lifestyle, six days a week. On your cheat meal day, you can consume 500 calories extra. So, if you are on a 1500-calorie diet, you can consume 2000 calories on a cheat meal day. This will prevent your weight loss from plateauing. You will also enjoy your food without a drop of guilt. Lost touch with your hobby? Pick it up again. Doing what you love and not feeling pressured to perform well in it can help reduce stress, improve productivity, and prevent you from feeling overworked all the time. Sleeping for 7-8 hours a day is mandatory for your brain and body to function properly. It also helps flush out all the toxins from your body, slashes out all negative thoughts, and enhances your mood. So, if you want to glow like Ashley, you must not ignore sleep. Ashley Graham is an icon and a role model for millions of people. Losing weight is her decision, and we should respect that. We get her strong message of being body positive and want to help her spread the word. Don’t change your body because someone else told you to. Do it only if you feel strongly about it. Moreover, being a certain size has got nothing to do with being fit. Aim to be fit, and you are sorted. Take care! The post Ashley Graham Weight Loss Diet And Exercise Plan appeared first on STYLECRAZE.